OFFERING UPDATE: 2nd Pre-Proposal Conference and Site Visit is scheduled for April 22, 2016 at 10:00 a.m. The purpose of the conference is to answer questions or clarify statements and requirements contained in the City's RFP/OM. Attendance is optional, but highly recommended. Location details below. The City of Miami (“City”) is inviting Proposers to bid on OM No. 15-16-008 for the purchase of the City-owned Miami Riverside Center located at 444 SW 2 Avenue, Miami, Florida 33130, and/or to bid on RFP No. 15-16-009 for the development of a new administrative building for the City. For registration as an official Proposer and to receive a complete OM/RFP package and addenda, Proposer must submit: (1) a non-refundable fee of $150.00 in the form of a cashier’s check, money order, or official bank check made payable to the City of Miami; and (2) the completed Registration Form (Form 3 below), to the contact indicated therein. The City has engaged the services of CBRE, a real estate development advisor/broker, for this assignment. CBRE shall represent the City in all negotiations; fiduciary responsibilities of CBRE exist only to and on behalf of the City. Please make sure to review this website periodically for Addendum updates. April 22, 2016 at 10:00 a.m.
Click on the links below to view and download the Appendices, Attachments and Addenda in their PDF or MS Word formats as applicable. *The above City Charter and Code Selections are included for reference purposes only and are neither an exhaustive nor updated list of applicable laws pertaining to this OM/RFP. Proposers are required to independently verify and abide by all applicable laws, rules, and regulations. 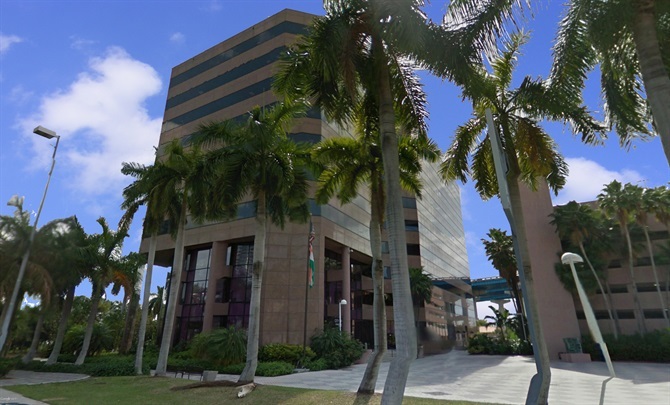 CBRE, Inc. has been engaged by the City of Miami ("City"), to issue this solicitation inviting interested proposers ("Proposers") to submit proposals for the relocation of the City’s administrative facility ("MRC"), and subsequent disposition of the existing facility. The goal of this solicitation is to obtain new Class B office space for the City’s administrative offices within the City limits, which will functionally, securely and conveniently serve the citizens of the City of Miami. In addition to proposing new City offices, Proposers are also encouraged to acquire the existing Miami Riverside Center ("MRC") located at 444 SW 2nd Avenue in Miami, FL 33130. The Miami Riverside Center includes the City administrative building, surface and structured parking, vacant land, and various infrastructure components (collectively, the "MRC Property"). The site is approximately 3.15 acres, which includes the building site and the vacant land to the south. The City also retains an exclusive easement over a portion of the adjacent site to the North. MRC is City-owned and located at 444 SW 2nd Avenue, in the City of Miami. The MRC Facility is approximately 374,661 comprised of the building, 194,679 SF, and parking garage, 179,982 SF, 23 years old, and unable to fully and satisfactorily meet the City’s future operating and client service needs. Accordingly, the City intends to have a new turn-key office building constructed, or may purchase an existing facility to house multiple City departments. The City may also elect to enter in to a "Lease to Own" transaction structure wherein the Base Rent will be derived by applying a Rent Constant, which shall be calculated based on the City’s credit rating and total development cost, or purchase price of an existing facility, as applicable. Please refer to Appendix I.AA. for details on the City’s credit rating. Construction of the City’s new office facility is anticipated to take approximately two years to complete, with a move in date no later than Spring, 2019. The sale / leaseback of the remaining MRC Site will likely occur prior to construction and / or purchase and occupancy of the new office building. The purpose of this pre-proposal submission and site visit is to answer any questions and/or clarify the statements and requirements contained within the City of Miami's RFP/OM. Attendance is optional, but highly recommended. If you have any questions please do not hesitate to contact us. We encourage you to submit your questions as they arise. We request that the questions be put in writing and submitted by e-mail or mail. When sending correspondence via e-mail or mail, please address the original to Shay Pope (CBRE), with a copy to the attention of Jacqueline Lorenzo, the project designee at the City of Miami. Any written questions received will be answered within fifteen (15) days of their receipt.